Have you heard of everydayhero? Well it's coming to the U.S. and you can preregister now! To see a video of how everydayhero works, click here. You can also check out their blog here. But below is a little bit about everydayhero from the literature that I received. "The everydayhero platform is transforming the giving experience by offering people a way to track and see all the good they do for causes they are passionate about. The platform not only allows people to raise and donate money to nonprofits, but it takes the notion of giving a step further. 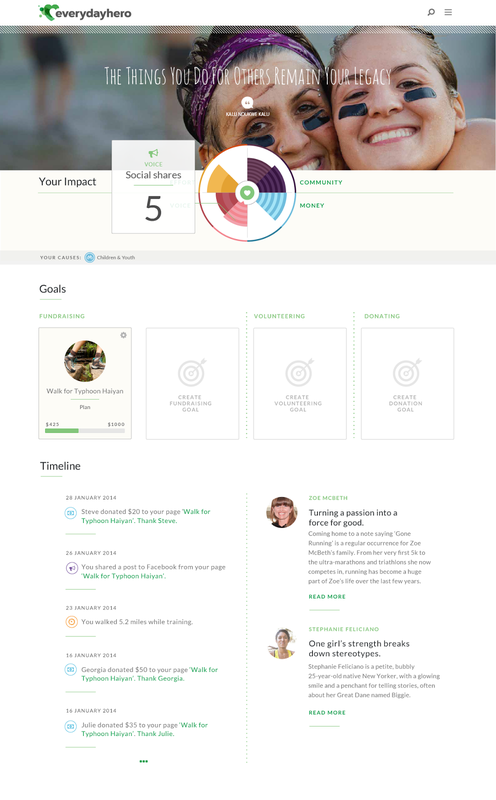 It allows users to raise money and track their Giving Footprint™ to measure, monitor and amplify everything they put forth when giving to a cause. Everydayhero wants people to realize that everything counts when supporting a cause, such as Leukemia & Lymphoma Society, Muscular Dystrophy, Breast Cancer Awareness or Animal Cruelty, and that every action should be accounted for and acknowledged." How cool is that? I just pre-registered, and I hope you will join me on my everydayhero journey. And to help you along your journey, I would like to give away 2 Fitbits. Oh yes, you just read that right! Two lucky readers will each win a Fitbit. For official everydayhero Terms and Conditions of the giveaway, click here. The giveaway is from March 10-March 14. Good luck. Enter below using the rafflecopter entry form. I would love to move up in the rankings on Top Mommy Blogs. Your vote (click) can help me do that. Just click below and I will receive a vote. Thanks! I am so passionate about adoption. I was adopted when I was 4 months old and it has always held a special place in my heart. I am also very passionate about ALS because I have a cousin who has suffered from that her whole life. Love this cause! I'm finding that more and more people are truly passionate about a cause. I volunteer at and run for the JDRF foundation. I like being healthy and giving back. A cause I really want to get into is animal rescue. My father's boss's wife runs a rescue where they go down to GA twice a year and pull a bunch of animals from high kill shelters and bring them back up to NY to adopt them out. I'm hoping I can tag along on their next trip. Nothing like saving some poor little puppy's life and showing it love and compassion to get your warm and fuzzy feelings going. Tagging along would be a great way to help out. I would imagine it would be hard to decide which ones to bring back. I would want to bring them all back! I wish I could say I am passionate about a specific cause. But I am not currently working on any. However, this year I have seen a lot of pay-it-forward programs going on, and I am participating in a couple of those. I think sometimes it's just great to do something nice for someone, for no other reason than to just show kindness! I love the pay-it-forward programs! I think it's awesome that you also donate through the business! I volunteer for the Girls on the Run, am a foster parent for an amazing animal shelter called the Sebastian Foundation for Animal Rescue. Race wise, I like choosing ones that support the Wounded Warrior project since I have had many family members serve. It sounds like you are passionate about several great causes! I support the Wounded Warriors Project -- what a wonderful cause & organization! I totally agree.. it's a great cause and organization. I'm passionate about Wounded Warriors Project. As a military wife, sister and friend it's wonderful knowing this organization is there helping so many people. I support Run Black Girl and Wounded Warriors; plus I try to run/support every local race that supports animal rescue/foster care. And supporting local races is a great way to support a cause. I too support local races. It feels good to help others doesn't it! Both of my parents passed away from cancer, so that is the cause that I am most passionate about. Sorry to hear about your parents passing away to cancer. I too have lost several family members. And I have to say that cancer research is probably the cause that I am also the most passionate about. I am most passionate about food security/hunger, particularly as it relates to children. We have a large food bank that I've worked with, and we also have a newer, locally-minded advocate group, which works with farmer's markets and farmers. That is such a great cause. Being the parent of a little one, I couldn't imagine not being able to feed my family. As both a survivor (lymphoma) and the daughter of a survivor (breast cancer), I am passionate about cancer. Definitely Crohn's and Colitis Foundation (I'd love to run with Team Challenge someday) and the Heart Association, both because of my Dad :) I also love any cause that supports empowerment, such as Girls on the Run! I volunteer year round for my local hospital. I was a sickly child so I know how depressing it can be to have to be in the hospital for extended amounts of time. If I can bring a smile or make someone laugh that is worth all the time I give to volunteering. I volunteer at the National World War I Museum. It's great to see people come to the museum and realize it's not just dusty old history, these were real people and more than just a name and date in a history book. Knowledge is power! I wish I find time to run too.